Mind Mapping for the Project ManagerAs a project manager, you probably live in charts: Gantt charts, Kanban walls, shared calendars, process diagrams, org charts, and so on. Each is useful in its own way for capturing what’s going on in your world, and for coordinating workflows across teams. But are any of your charts helping you to be more creative with your problem-solving? Or helping you uncover hidden roadblocks and opportunities? Mind maps are a great tool for project managers because they help you achieve those alternate benefits. By opening up a more holistic way of thinking, they offer a great supplement to your existing visual aids. They get around the rigid limitations of Gantt charts to help you find the new approaches that might take your project and your team to a higher level of creativity. Here’s why you should dedicate at least one whiteboard to mind mapping. 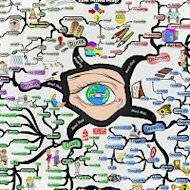 While you don’t have to pattern your mind map exactly like a tree — or make it as pretty as Nelson’s — to get it to work, the organic metaphor isn’t an accident: Mind maps are intended to capture ideas and the relationships between them in more free-flowing ways than an outline or Gantt chart ever could. In some sense, rigid hierarchies such as Gantt charts are inherently limiting; even when they do a great job of describing the reality of sequenced tasks, they don’t “breathe” much, or leave a lot of room for exploration. By contrast, many people find that mind maps help them look at projects or other concepts in new ways. The visual appeal and holistic nature of mind maps can stimulate different ways of thinking, clarify connections for you and your team, and even improve your basic ability to capture relevant information. While the roots of such radial diagrams go back for centuries, mind maps as we know them today began to be popularized about 40 years ago by British author and broadcaster Tony Buzan, who wrote many books aimed at helping people use their brains better. In The Mind Map Book and other volumes, Buzan touts mind mapping for its benefits in improving memory, creativity, information capture, and other cognitive areas. Buzan often uses the term “radiant thinking” to encapsulate the appeal of mind mapping. As he explains it, the human brain naturally engages in this type of thinking when it encounters just about anything: an idea, a sound, an image, an emotion, whatever. At the center of our thinking is the thing itself, for example the sound of a bumblebee buzzing. But then, radiating in all directions from that thing, are countless associations (what Buzan calls “hooks”) into other ideas: black-on-yellow coloration, fuzziness, honey, sunshine, summertime, beeswax, bee stings, and on and on. This creates a powerful map of information within the brain — which is the payoff of radiant thinking. Other approaches to note-taking or brainstorming miss out on this payoff. Our notes, even when detailed, are often not very visual. Things like process diagrams tend to lock us into thinking along well-defined paths. Mind mapping, by contrast, uses compelling visual images that allow us to explore non-linear connections among ideas, while also evoking more visceral connections — stirring even more of our creativity. 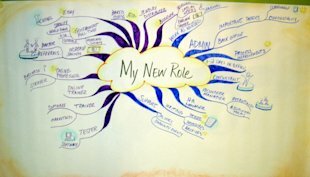 For starters, try mind mapping as your new technique for taking notes during meetings. Instead of jotting things down from the top of the page to the bottom, put the core idea in the middle of the page, draw a cloud or a star or a box of some kind around it, and then let each new major part of the discussion create its own new branch of the mind map. When I do this, it’s amazing to me how I see things differently. I find myself going back and forth among the different branches, adding details, jotting down questions that radiate from particular nodes, and even drawing little “vines” that connect ideas that live on different branches. I pay more attention during the meeting, and I leave with a much better idea of what I could do next to move the work forward. Once you’ve had some practice with that, try using a mind map on a white board — or projected on a screen — as the basis of your next presentation to the team. Tell them you’re shaking it up a little bit, even if it’s just to break the monotony of the usual PowerPoint slideshow. In The Mind Map Book, Buzan offers a lot of detail on how mind maps can be used to give more natural, free-flowing presentations, ones that easily allow you to expand or reduce the amount of time given to any one topic based on the reaction and interest of your audience. In that book, he also digs into the uses of individual and group brainstorming with mind maps. All of the benefits of radiant thinking discussed above come into play here. If your team gets enthusiastic about the process, you can even make group mind maps that fold together many individual smaller maps into one big, well-organized compilation of the team’s ideas. Promoting new conversations. When you let radiant thinking do its work, it allows you to form new mental connections. That applies equally to the ideas within your own mind and to all the ideas shared across the minds of you and your team members. Unlocking new associations among these ideas can be very powerful for getting out of old ruts of thinking and finding new, creative ways to tackle problems. Suspending judgment on emphasis. When you map things radially, you take away the rank order and chronology that’s inherent in an outline or Gantt chart. Instead of prematurely worrying about which part of your project comes first in sequence, or which part deserves the most resources, you can focus on getting the right issues surfaced in a way that promotes dialogue, understanding, and problem-solving. Then you can take the next steps for ordering and ranking your team’s activities with much more clarity of purpose. The Lifehacker article discusses the pros and cons (mostly the pros) of each of these, and gives details on which apps work on which platforms. In general, though, these apps are designed to be easy to use and quick to learn. Personally, I’d like Coggle to give me more ability to change how the branches and labels look, for example by using heavier fonts and writing the label right along the length of the branch itself. Still, this isn’t a bad result on the fly, and the learning curve is low. Even better, the business-oriented software packages include features which could be very useful to some project managers. XMind, for instance, allows each mind map to be translated to a Gantt view — making the connection explicit between the different types of charts that creative project managers may want to use. Still, before you even dig into the available software tools, I encourage you to get out a clean sheet of paper and a few pens of different colors. Put down one idea you’ve been working on in the middle of the page, and give it some visual punch by using shapes, squiggly lines, different colors, or whatever works for you. Then start radiating out from that center with key facets of the idea, and let your mind roam as you fill in finer details and start to notice new connections. Just try it as an exercise in making something by hand, even if your first effort ends up looking like a mess. Although there’s still a lot we don’t know in this area, recent research into the neurological benefits of writing things down by hand would seem to bear out the idea that you should at least give hand-drawn mind maps a try. Human brains seem to respond well in terms of focus, memory, and fluency of creativity when we write or draw by hand. Buzan himself has encouraged people to invest the time and effort to create their own images by hand. Even if you’re a bad artist, those extra moments of attention may trigger more of your holistic thought processes and shake loose some new ideas you wouldn’t have had otherwise. By hand or with software, by yourself or with your team . . . how will you put mind mapping to use for your projects?